Published By – Startling Music Ltd.
All songs published by Sony/ATV Music Publishing LLC, except 9, 18, 22 Harrisongs Ltd. and 16 Startling Music Ltd. Artwork © 2007 The Cirque Apple Creation Partnership/Apple Corps Ltd.
℗ 2007 The Copyright in this sound recording is owned by EMI Records Ltd./Apple Corps Ltd. 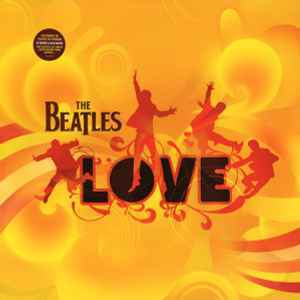 THE BEATLES Love (2007 double lp set pressed on 180 gram vinyl containing almost 80 minutes of music issued in conjunction with the extravagant Cirque Du Soleil at the Mirage Hotel in Las Vegas and featuring classic Beatles tracks reworked from the original 1960's session masters by George Martin & his son Giles.Housed in a gatefold picture sleeve, complete with a deluxe 28 page booklet containing all of the imagery and photo's from the CD version. I really 'love' this album. To me, it sounds like what a Beatles concert would sound like today, doing their hits but mixing up like a true artist would. Also, the re-mixing of the songs, in my opinion, is a frsh way to hear these classics. And the sound is incredible, especially on vinyl. I highly recommend this and another finely remixed/rematered album, The Yellow Submarine Songtrack on vinyl as well. I dare say my favorite Beatles album, as, even though the purists are now screaming at me, it's a very good collection of Beatles songs with a certain "soundscape-y-ness" added on top without removing the greatness of the original songs. And a really, really good pressing. I'm absurdly familiar with the CD version and yet this copy seems to far outpass it. I could go on about all the "fuller, warmer, more presence" clichés, but if you're looking at this then you're already familiar with those. With that being said, there's a certain "tangibility" that I don't think can be equalled; whether you want to get lost in the world or hear the musicians playing. The break points between sides are surprisingly well handled in light of the fact that there's rarely a silent moment on this album. About the only problem I have is that I seem to get miserable inner groove distortion; but with that being said I only have the Audio-Technica AT95E - a good needle, but not the best. Point is, I think this is a case of "I need a better turntable" rather than "this album needs a better pressing." The packaging is equally bien, well printed for both the cover and the booklet - although the cover's the only gatefold - or even triptych - which does not fit in my poly outer sleeves, and thus must go unprotected. Minor quibbles aside, get this pressing while you can, if you at all plan on improving your setup as time goes on. If not... perhaps stick to the Optimal ( http://www.discogs.com/Beatles-Love/release/6389529 )?